I know you’ve seen them too – ads for super affordable clothes from China. But are they legit? Do they ever get to you, and when they do would you wear them? One company I see advertising cute things all the time is SheIn. Now I know these companies have a rep for horrible customer service and a lack of transparency regarding shipping and sizing. So I decided to do some digging. The company offers express shipping in 3-5 business days for US residents. They have also sizing charts for each item. It’s annoying to check each one but by combining the sizing provided and some tips I found for shopping these sites, I thought I could get a decent fit. These were the prices before any coupon codes, cashback, etc. Click the links above to be taken directly to the item on the SheIn site. A couple standouts that I was extra excited for were first off, the shoes! The espadrilles are what look to inspired by the Valentino Rockstud Espadrilles and the camel colored sandals? Yes, those do look an awful lot like the sold out sandal of the season, the Hermes Oran. I was also really happy to get some quality basics and new tops for work into my collection. The order went smoothly. I paid with PayPal and received an email confirmation right away. The next day I received a shipping confirmation with tracking from DHL. My package arrived in 6 business days and I was so. excited. So I started tearing into these bags and what I found was a huggggge mix of qualities and sizes. It became very clear very fast that these clothes were being sourced from many different warehouses and depending where it came from I was going to have a very different experience. This was gonna be a bumpy ride. I started with the white blouses. The print one had a lovely pattern but the fabric was downright scratchy and it had two weird seams down the front that just looked wrong. The blouse with the tie was way too short (and I’m only 5’2″). The win in the bunch was the lace top. It was truly gorgeous but entirely too small. I may reorder it about 2 sizes bigger than the size chart recommended to me. Moving onto the black tops. The flouncy sleeve chiffon shirt had a very cute gold zip on the back. It reminded me of super similar tops they sell at The Loft more expensively. I would consider reordering this shirt in about 2 sizes larger as well. The black scallop tee is one of the only items I’m keeping! Unlike the photo, it is a cotton blend with some stretch and adorable. But my favorite of the black items by far has to be the off the shoulder shirt and by my favorite I mean it was atrocious. The fabric felt like the raw cotton blend you buy at Joann Fabric and the little arm holes barely fit my wrist. Major eye roll on this one. Moving into another item that gave me a laugh, the t-shirts. The grey one was super nice and I’d get it in a couple other colors (though I threw it right in with the laundry because it smells of old Pad Thai). But the black and white are that weird, reflective, scuba-esque material they used to sell at Joyce Leslie. Ugh. And finally, the accessories. They were all good quality, honestly! The espadrilles are too narrow so I’ll be returning them but they all look like shoes you’d pick up at JC Penney or another lower end mall department store so not bad in my book. Frankly, the Hermes dupes are way better quality than the others and I will be getting tons of use out of them. They are my favorite item by far. So what is my overall verdict? You never know what you’re going to get on sites like SheIn. There is no continuity of size or fabric. A lot of the photos make the fabrics look much higher quality than they are. There were some diamonds in the rough that definitely made the experience worthwhile but unless you have the money and time to spend, stick with Forever 21 and H&M for fast fashion, where you know what you’re in for. Are there any other sites like SheIn that you’re curious about? Comment below and be my next haul-spiration. I am back with a meal prep blog for you. With the plethora of ice cream I’ll be inhaling over the next 8 weeks, it’s important to keep my eating clean when I’m home. And since the majority of my next 8 paychecks will end up in boardwalk souvenir shops, budgeting is important too. I based this budget off of the food my boyfriend and I actually eat so obviously feel free to modify it as necessary. I chose almost all dinner recipes that can be made in a crock pot (indicated with CP) and prepped in advance for my fellow young professionals. These recipes are all low in fat and there are at least 2 vegetarian meals included per week. As far as recipes go, they are a collection of my faves from Pinterest and beyond, but I will provide links to give all these talented ladies cred. So here goes! Breakfast and lunch are pretty simple, just plan ahead. Follow the instructions linked for dinners. I recommend taking time on a Sunday morning to prep all your crock pot meals. Throw them in thick freezer bags, label, and store. If you’re interested in me doing another post on exactly how to meal prep with freezer bags, let me know. I feel like there are plenty of examples of this on Pinterest for reference. I rounded for the most part but all told, my ShopRite at Home app says $96 total for this plan! Anticipate that you may also need to pick up some spices as needed. Anyone who has a local ShopRite, I would encourage you to try out their at-home service. Right now, they’re offering $15 off when you spend $75 and $10 off $20 in General Mills products. Plus, you can schedule a time that’s convenient t for you. Using this service alone has saved us hundreds because I have time throughout the day to slim things off the list and don’t pick up things I don’t need while perusing the aisles. I hope you enjoy all of these recipes as much as I do, at a price point you can afford. What do you want to see next? Challenge me to an even slimmer budget? Just MORE MEALS? Let me know in the comments below! 1) Stores have people counters that measure how many people walk in and make a purchase. So when you come into the store with your three children and husband and sister’s cousin’s friend (who leaves to use the bathroom twice), your measly scarf purchase cost me at least 7 bodies. 2) We have to greet you when you walk in the store. You know it, we know it. Just don’t be a jerk- smile or say hi back. 5) Your 52 month old is totally adorable but she’s ripping down all the pearl necklaces with a vengeance and climbing under that mannequin doesn’t seem safe… Keep an eye on your little darlings. We are associates, not babysitters. 7) Don’t share a fitting room. There’s no way for me to know if you’re siblings, friends or partners and I’d rather avoid a… sticky situation. Public indecency, anyone? 8) Leave your unwanted garments in the fitting room or on the rack provided. I know you think you’re being helpful by putting them away but you end up hiding items in plain site, leaving a lot more clean up at the end of the night. 9) Every retail worker’s FAVORITE thing to hear is, “This doesn’t have a tag. It must be free!” Ha ha…….ha. 10) Retail workers have families and lives outside of the four thin walls of their store. Be mindful and don’t start to shop ten minutes before close. If you’re in a pinch and need something specific, locate an associate and let them help you. It’ll make your whole experience more positive for all. Fill your blender with half a banana, one scoop protein powder, 1/2 c milk, 1/2 water, 3-5 ice cubes. Blend until smooth. Preheat oven to 400 degrees F. Clean boneless breasts. Beat to make tender and of even thickness. Arrange on a cookie sheet covered in foil. Coat in 1 tbsp of olive oil and italian seasoning on both sides. Bake for 15 minutes. Turn over and bake for 15 more minutes. Chicken is done when it is 160 degrees inside on food thermometer. Scrub potato skins clean, then pierce with fork throughout. Place in microwave for 10-13 minutes. You may have to do this in two batches depending on the size of your microwave. Potatoes are done when they can easily be scooped from their skin. Black Bean Potato: Arrange half the flour tortillas flat. Spread a thin layer of cooked potato innards onto each tortilla. (This should use about 1.5 potatoes.) Rinse black beans and place 1-2 tbsp on top of potatoes. Avocado Hummus: Pit and scoop out avocados. On the other half of the tortillas, spread a thin layer of avocado. On top of that, put 1 heaping tsp of hummus. Each dinner container should include 4oz chicken, half potato, vegetables. Each lunch container should include one of each type of tortilla and a cup of fruits and vegetables. With the new year comes resolutions and for three quarters of the country that involves living a healthier lifestyle. For me, eating healthfully is less resolution-driven and more about my ultimate goal to live a long, healthy life. It’s thought that at least 70% of your weight (whether healthy or not) can be contributed directly to food intake, not activity! Now that is not to say that activity isn’t important- it absolutely is essential to keep your muscles toned and flexible and keep your bones and heart strong as you age. But for those who struggle with weight specifically, hitting the gym may not be the BEST you could be doing. You need to start putting an emphasis on food. You need to evaluate your relationship with food. I am very much in tune with my Italian foodie heritage and trust me when I say in my family food is used as the ultimate aid to any and all celebrations. If you earned straight A’s, you picked a restaurant. On your birthday, mom made your favorite stack of pancakes for breakfast. And let’s not even get into the fact that Italian American Christmas Eves involve SEVEN main dishes. It’s great to have food help you celebrate life’s accomplishments but Italian families have this wonderful way of making everything into something. Christmas, we can eat like crazy. Ok, sure. But then there’s Christmas Eve, and the day after we can meet with our cousins on your mom’s side, and the three days after we’ll eat leftovers and BOOM, New Years and the whole thing starts over. End of January is my sister’s birthday. Huge party, huge spread of unhealthy food. With so many cousins, there’s a party in this fashion every month or so! With an immediate family of 30, that’s just how it goes. I am only as good as my planning and that is why I have made a commitment to healthfully preparing my meals in advance so I know what I’m putting into my body. Not only will this save me calories, but also help me eat more disease fighting, fresh foods like pure proteins and fruits, and also seriously cut back on my food bill. Ready to take the plunge? Give me one week and see how your stomach and wallet feel. Head on over to Meal Prepping 101: Getting Started for this week’s food and a step-by-step guide and budget. Oh Amazon. The enemy of most a modern-day store. To be honest, I don’t think Amazon is any more to blame for the hit brick-and-mortars and mom-and-pops have taken than say Walmart. Amazon has carved its own niche in that it is exclusively found online. The only times Amazon really competes product for product with local, small retailers is with its Amazon Fresh program and same-day shipping. Fresh competes with local franchisey supermarkets and if same-day shipping is available, that’s basically like delivery from your favorite store. I can see how in the select metro areas where these programs are offered, things are a little dicey. Still, when Amazon comes into an area it creates tons of jobs. How great those jobs are is up for discussion. Regardless, I am a former member of Amazon Prime (the cheap, student version) and loved every minute of ordering products at 9pm on Sunday and having them arrive by Tuesday afternoon for free. I think my mailman started to get irritated with me so I have since cut back. One product I buy from Amazon every. single. time. I need one is iPhone chargers. Amazon sells a line of technology staples called “Amazon Basics”. They ship free, Prime or not, in hassle-free, low-waste packaging. The items are of the same quality and full-compatibility of an Apple original product because they are Apple certified. (No “this accessory may not be legit” messages for you.) The chargers come in the standard length as well as an extended length which I prefer because of the configuration of my nightstand. The longer one is around $12 and the standard retails under $10. Recently, my sister borrowed my charger (which I have owned since July) and she broke it. I don’t know how. I did ask. I was met with denial. But the plastic piece where the head connects to the cord was pulled a bit and I figured the product wouldn’t last much longer. I immediately went online to order another one when I saw something about warranty information from the last time I’d purchased the product. 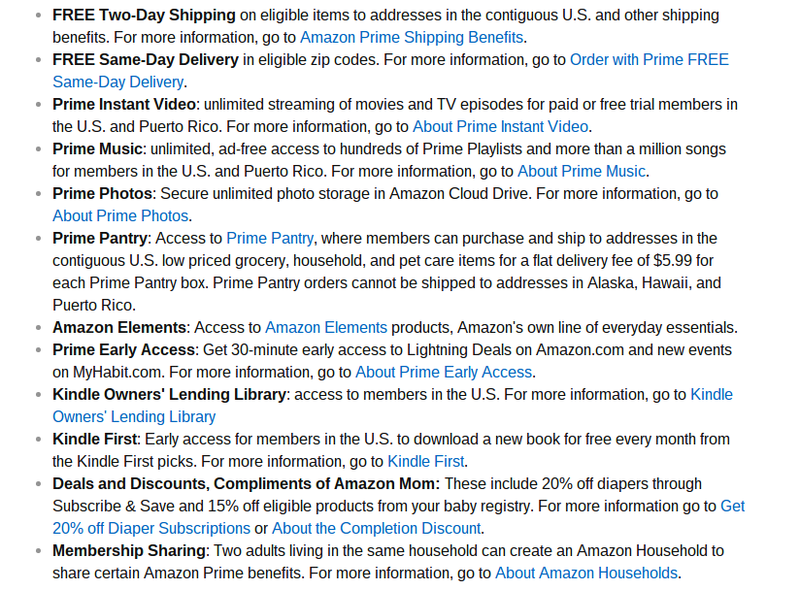 Apparently, there is a one-year warranty included on all Amazon basic items. I emailed customer service and the representative emailed me back a few hours later, apologizing and providing a tracking number. A new charger had been sent my way already, with free next-day shipping. I did not need to show proof of the defect or return the old product. I was speechless. And if you know me, that never happens. I was just truly, momentarily taken aback by that level of customer service. By the fact that this company had diligent enough records to know what I bought and where to send the new one. That they had an actual person email me and promptly. That they managed to make me feel like I just walked up to the customer service counter and was given personal attention, all through a screen. Today is National Free Coffee Day. (That definitely wasn’t a thing until last year.) I have an interesting relationship with the good ol’ brew. As a kid, I hated it. Loved the smell but frankly felt like it tasted like wet sand looks only nuttier. In high school, I was somehow introduced to iced coffee with caramel and pumpkin and sugar and creamer and all that other horrible fake stuff and I. was. in love. I looked forward to stopping at Dunkin’ Donuts on the way home with my permit. Still, I was never the type to drink coffee every day. Then college hit. And my once-in-a-while drink became my multiple-times-a-week, why-am-I-premed-again? drink. But coffee started to replace breakfast and besides going broke, I started to feel jittery. So I quit coffee altogether and then added it back in slowly and that was great and is the point I am at now. I still don’t drink coffee without breakfast first. That seems to prevent the jitters. And to be honest, once I’m awake I have enough energy to not need a cup. I usually get my coffee around two or three in the afternoon when I’m at work or school and feel sluggish. I am also careful about drinking coffee at night because hot or iced, it gives me heartburn if I drink it and then try to sleep. Note: Word has it that if you sign up for the DD app today, they will give you a free coffee every week for the whole month of October in addition to National Free Coffee Day, Eagles Days, and Rewards Perks. What?! For today, I hit up DD and my dad hit up Wawa for freebies. DD limits the coffee to one per customer but if you want to be ambitious and you drink the stuff daily, stop by a couple neighborhood Dunkin’s (they’re on every corner around here) and get all iced coffee cups after the first with no ice. The coffee won’t be watered down so tomorrow morning you can just add in your own ice and be on your way. You could also order your coffee hot and put it in the fridge when you get home (which is my favorite way to do iced coffee at home anyway). Just like with the Eagles promo, you can get any flavoring you want so this is a great opportunity to try out DD’s seasonal pumpkin spice syrup. Yum! 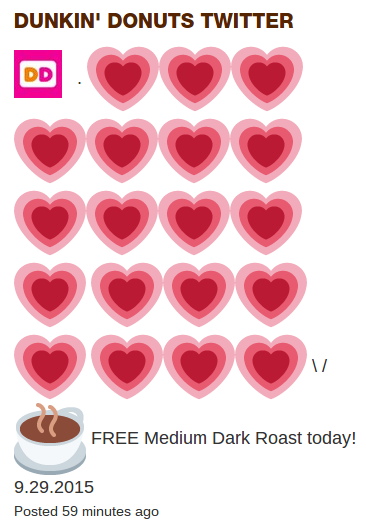 Note: All free coffee given out will be DD’s newish Dark Roast so keep that in mind when opting for skim milk. Wawa does not limit you to one cup of coffee so feel free to get some for the office. However, there is a lot of miscommunication within Wawa about iced coffee. 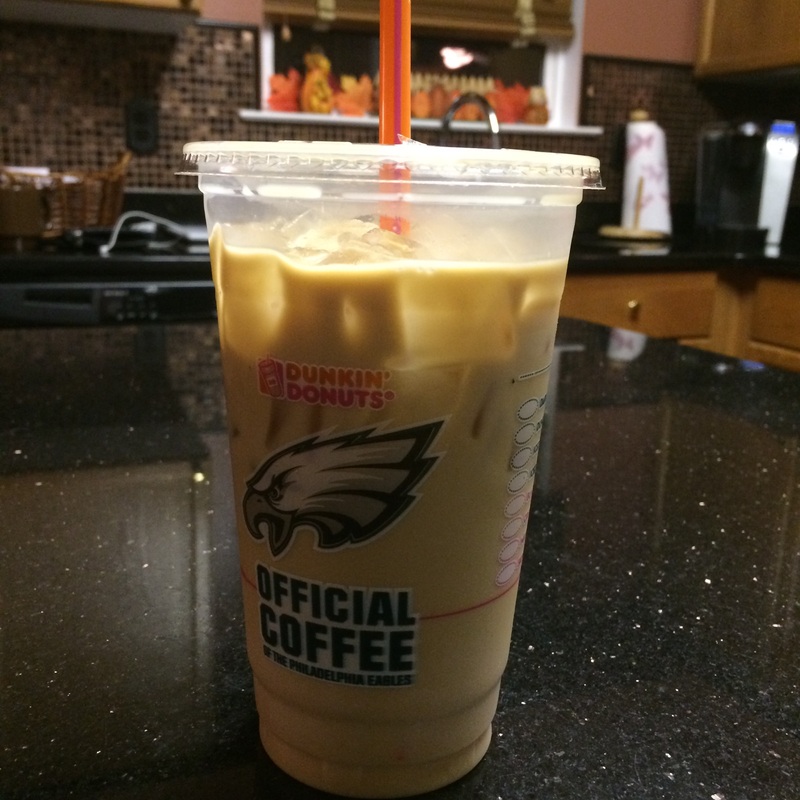 Last year, I saw on the Wawa site that all coffee, including iced from the machine, was free. I saw posts upon Instagram posts with girls and their free iced Wawa coffees. And yet when I got to the counter, they tried to charge me for mine! I was about ready to pull up the Wawa corporate page to show where it specifically said iced was included in the promo but the kind gentleman behind me paid for my cup before I had the chance. (The gentleman was my dad.) So again, be careful with that and don’t be afraid to ask questions. Are there great coffee deals at the chains in your area today? Where are all my Tim Horton’s peeps? Comment below with your National Free Coffee Day story!